Jenny Thompson is a absolute legend in female athletics. She inspired many female athletes and acted as a role model to many. 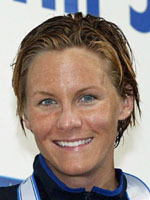 Her accomplishments were unprecedented by any female swimmer, and she helped the USA Swim team to become known as the best team in the world.